Looking for more local spots in Paris? Make sure you get yourself a copy of our 2019 INSIDR Free Paris Travel Guides! The passion, taste, craftsmanship, creativity, and happiness are the key elements to a good chocolate making. Paris chocolate shops are amazing places to enjoy some! Get ready to taste the best chocolate in Paris chocolate shops. Here is INSIDR’s selection of the best independent Paris chocolate shops. While you are tasting some amazing pieces, meet the master chocolatiers as well. Maybe they will give you their secret recipes, who knows? Enjoy the deep smell of tempered chocolate, joyful fruit flavors and roasted nuts within the delicacies! Jean-Charles Rochoux is definitely a chocolate master who is able to combine both the craftsmanship along with the impeccable presentation and flavors of the chocolate world. He is a chocolate sculptor in the first place. Chocolate sculpting is one of the most intriguing areas of the pastry world; it is certainly one of the hardest. Yet the results are amazingly beautiful. Here at this workshop, he creates more than chocolate sculptures of course! Forget the ordinary chocolate pieces you see. This shop is a whimsical place where you can taste the divine flavors of chocolate! 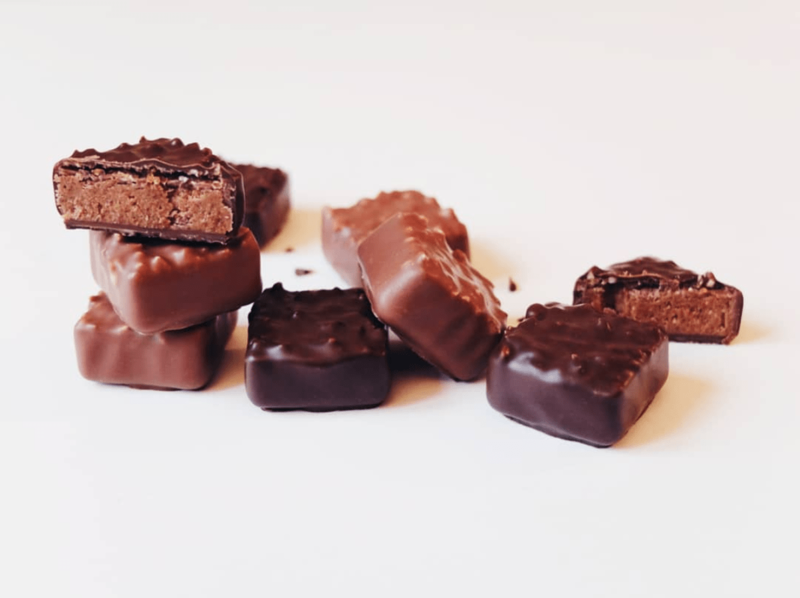 Especially liqueur filled bonbons –such as Chartreuse, Cognac or Calvados, seasonal chocolate bars and special sweet spreads with Piedmont hazelnut, salted caramel – all of these are insanely delicious, don’t miss it for the world! Henri Le Roux is chocolate and a caramel master who followed the family roots. In 1977, he decided to draw his own path and opened his place in Quiberon. Still, today the products and all kinds of sweets at this workshop are hand-crafted. Luckily, there are several stores of Maison Le Roux in Paris to enjoy the magical tastes of Le Roux chocolates and sweets! Le Roux is a well-awarded brad at the same time – most notably the possession of Tablette D’Or and it’s the highest award of the Guide. Le Roux is known worldwide by its Caramel au Beurre Salé – the salted butter caramel and Truffe de Truffe – moist bitter chocolate truffle with the fresh truffle itself! The master is a true believer of the highest quality cocoa beans, natural and seasonal products with no preservatives and of course the hand-crafting of these materials. Maison Le Roux is certainly a must-visit and taste place for you while you are in Paris. Hugues Pouget decided to open his own boutique store in 2010 at St. Germain-des-prés neighborhood. Not surprisingly, the area is one of the chicest places in Paris. Chef Pouget had a marvelous career which he worked with well-known chefs and brands. Pouget has also a big dedication of fruit and delicate aromas. This can be seen in his chocolate and sweet works mainly known as reminiscence from southern France where he grew up. Hugo & Victor has authentic flavors – no artificial aroma or colorants, ethical work mind, respect to sustainable production and local resources as well. Along with exclusive chocolate boxes, you can try their macaron, seasonal fruit pastries as well. Embark upon a sublime tasteful journey with just a few bites of Hugo& Victor chocolates! Jadis et Gourmande is a specialized chocolate brand in Paris since 1976. The reputation of the chocolates comes from the artistic and creative production of the shapes. These include the shapes of the smartphone, high-heeled shoes, a bottle of wine or champagne, also the letters of the alphabet. Now, each season Jadis et Gourmande introduces you to a new shape and a taste of chocolate collection as well! The key element of their production is the creativity and of course the high quality. All of the chocolate products are made with pure cocoa butter and couverture with 71% cacao. Paris chocolate shops require great attention to details with great know-how of the raw material for their chocolate quality. Jadis et Gourmande is a place where you can enjoy these out-of-this-word chocolates with their high-quality ingredients. Surprise your fiancé or your family with their delicious sweets and chocolate from Jadis et Gourmande. Don’t forget to save some for yourself too! The Servant is open since 1913 and still follows a respectful and quality production of the family business. The workshop and the store is in Auteuil neighborhood which is known for its architecture and the famous writers. For more than 100 years, this place continuously produces chocolate precuts including the confectioneries and gourmet sweets. It is hard to go wrong with more than 100 years of experience – the chocolates here are the drops of heaven! Their candies, fruit jellies, candied chestnuts, fruit confits are whole different worlds to talk about. When you enter the shop, you will want to grab one piece of everything – not to forget. The Servant is where you’ll find your inner child with the confectioneries and your passionate side with all the chocolates! The story of Maison Caffet began 64 years ago near Troyes. The parents of Pascal Caffet established a bakery shop and then a chocolate shop. The chef followed this family path and took over the family business only when he was 22! He actually won the championship of Monde des Métiers du Dessert – which is one of the most renowned competitions for the dessert and pastry. All great Paris chocolate shops will attend the competition. In addition to that, he was also awarded “Meilleur Ouvrier de France” in the Pastry & Confectioner category in 1989! Maison Caffet is exceptionally at its best with the pralines. These pralines are known as “without the doubt the best pralines in the world”. Fortunately, there is a store of Maison Caffet in Paris, so you don’t need to worry while you are visiting as well! Grab a pack of their famous pralines, a jar of chocolate-based spread and also maybe some nougatine for you!